President Cyril Ramaphosa will this afternoon address the 25th annual Investing in Africa Mining Indaba underway in Cape Town. The four-day indaba is the world's largest gathering of mining's most influential stakeholders and decision-makers vested in African mining. With this year's theme being 'Championing Africa's Sustainable Economic Development', the indaba will discuss resource nationalism, innovations in technology, battery metals and diversity in mining and sustainable development, among others. President Ramaphosa is scheduled to speak at 3pm and will be joined by his Ghanaian counterpart Nana Akufo-Addo, the Presidency said on Monday. The Presidency said it views the indaba as a strategic forum to attract and promote foreign direct investments in different industries of the mining sector. "The President will present South Africa as a competitive and investor friendly destination that offers a unique combination of highly developed economic infrastructure and a vibrant emerging market economy with sustainable investment opportunities," the high office said. 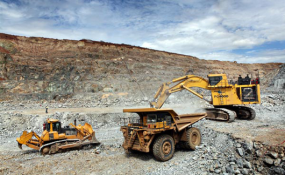 Government, through the Department of Trade and Industry's Industrial Policy Action Plan, has identified mineral beneficiation as an area of work that presents an abundance of opportunities that investors can take advantage of in order to grow the mining sector. This provides the massive potential of contributing to growing the country's economy, creating jobs, transformation and eradicating poverty.